Now in its fourth edition, Craft and Micro Distilleries in the U.S. and Canada is the definitive guide to small batch artisanal spirits, perfect for fine spirits connoisseurs or novices pouring into the spirit world and for anyone who wants to find great spirits while traveling. It's also a great resource for anyone who wants to start their own craft or micro distillery. 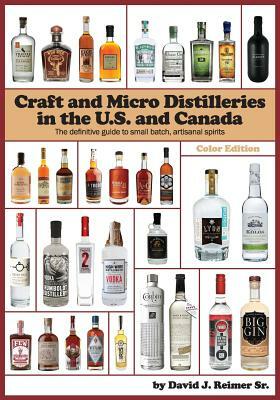 This updated edition includes information on more than 2,500 unique spirits and 580 craft and micro distilleries from all 50 states and across Canada, hundreds of photos of bottles and labels, and information such as: Locations and hours, and tours and tasting times Websites and social media Spirit descriptions, prices, and distribution Interesting facts and historical anecdotes The book also includes a listing of spirit festivals, events, and museums; a listing of distilling associations and guilds; an index by spirit type; and additional spirit information and resources. Available in black and white and full color. "A 'must read.'" - MicroLiquor.com "An excellent guide to the interesting world of craft spirits." - DrinkUpNY.com "The most comprehensive book cataloging the hundreds of craft distilleries." - Drink Me Magazine "Well written, a great read, and a massive amount of interesting details on every distillery. No where will you find a more comprehensive yet accessible reference on this subject in one well laid out book." - Chris Carlsson, SpirtsReview.com.